Well, to be honest, it isn't very difficult to play roulette. You have one numbered wheel, 1 - 36, plus zero field and double zero field. And a ball. That's it. There is also a board on the table with all the numbers, and with fields where you can put even-money bets - you can choose to play on red or black, odd or even, or, maybe, numbers between 1 and 18, or 19 to 36. Of course, you can play on every single number that you want, also, and some combinations. When we are talking about Atlantic City Casinos, there is an interesting thing that they offer, and you won't find it in some other casinos - if you place an even-bet, and you loose, it will cost you only half of your placed bet. That lowers the house edge, but, considering the fact roulette is one of those games with high house edge, you don't have to worry about their prosperity too much. Some casinos offer single zero games, some don't. The single zero game is also called the European Roulette. 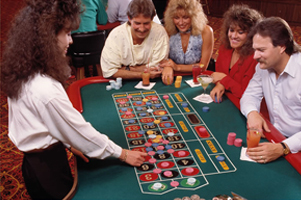 In some Atlantic City Casinos you can find ten or more tables for roulette playing, and only one European Roulette table among them. Your chances for leaving the casino with bags of money after playing roulette aren't very high, but the game itself is, if nothing else, fancy. If it is good enough for Bond, James Bond, what more we can say? In Atlantic City Casinos, the usual minimum bet is 10$, but the maximum bet can go up to 5000$, like in Atlantic City Hilton. They do offer 10 tables for roulette playing, but if you are interested in European Roulette, you will have to go elsewhere. In some casinos minimum bet is even lower - only 5 $, like in Harrah's - they offer 10 tables also, but among them is also one single zero table. The difference is in high bets - the maximum is only 200$, with the exception of double-winning games, where you can put up to 2500$. The single zero table you can find in some other Atlantic City Casinos, for example in Trump Marina Hotel Casino.